What is The Fern Club? Who is The Fern Club? This taste safe pink wobbly jelly was intended for play, and wow did it get played with, but not by everyone. Some children really aren’t keen on messy play. Fact. So as parents are we meant to encourage, cajole and entice little fingers to get messy or is it ok if they resist? What even ARE the benefits to messy play? How is it STEAM learning and should you be worried if your little one doesn’t like getting messy? So many questions! 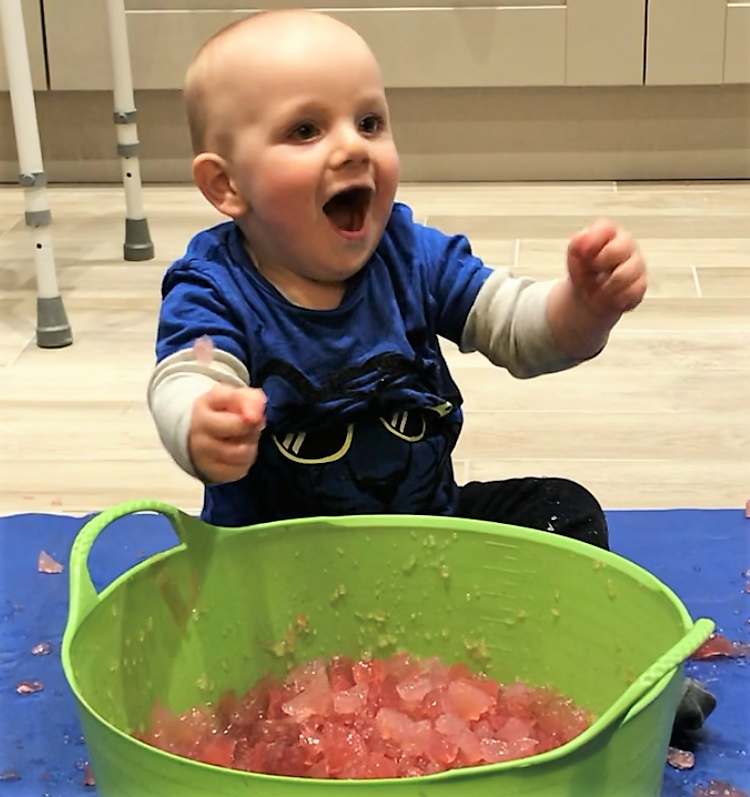 I suppose to start with it’s important to say, messy play is anything which obviously involves getting messy Paints, jelly, dough, pasta, water… you get the idea. There’s more though, think about your every day and how those little hands interact with the world around them. Hummus at dinner time is a messy experience in our house, as is bath time, playing in the garden and going to the woods. When children are able to get their hands interacting with the world around them, they’re able to fully experience all the materials have to offer. Grasping, grabbing, squeezing, flowing through fingers, immersing their hands, covering and uncovering, measuring, weighing and problem solving. The list of could go on. In terms of movement skills, messy play helps develop fine motor skills, muscle development (not just in the hands but the whole body) and proprioceptive awareness. STEAM (science, technology, engineering, art and maths) learning and messy play also go hand in hand. Learning about substances, textures and quantities. It’s also a fantastic chance to explore measuring and weighing and did you know attempting to stack and sort pasta helps develop spatial awareness ready for more advanced maths skills too! So what happens when your littlest doesn’t want to engage in messy play during class? Well, absolutely nothing. It’s really no big deal. So they don’t want to cover themselves in blue paint or play with the pink jelly. That’s ok! They will still explore the world around them and will learn just as much as a child who goes headfirst into the bucket full of cooked spaghetti! There is no right or wrong answer. Just like the old “love it or hate it” Marmite debate, messy play just isn’t for everyone. © 2019 The Fern Club. All Rights Reserved.